Sam Bergman joined the Minnesota Orchestra in 2000. In addition to performing as violist, he serves as host and writer for the Orchestra’s Inside the Classics concert series, and also hosts the Orchestra's Symphonic Adventures programs for high school audiences. He has participated in many of the Orchestra’s chamber concerts: recent performances have included Brahms' C minor Piano Quartet and Brett Dean's Night Window for viola, clarinet, and piano. Bergman was a driving force behind the Musical MicroCommission, through which the Minnesota Orchestra commissioned a major new work from Judd Greenstein, funded entirely through donations by more than 400 individuals. Greenstein’s Acadia was premiered by the Orchestra in March 2012 and was performed on the classical subscription series in April and May 2015. In addition to his Minnesota Orchestra activities, Bergman is principal viola of the Cabrillo Festival of Contemporary Music in Santa Cruz, California, and performs regularly with IRIS Orchestra in Tennessee. In recent seasons, he has also performed with the Atlanta Symphony Orchestra, Chicago Symphony Orchestra, New York Philharmonic and Philadelphia Orchestra. He has served on the faculties of St. Olaf College, Apple Hill Center for Chamber Music in New Hampshire and Greenwood Music Camp in Massachusetts. Pianist and JOYA Artistic Director, Mary Jo Gothmann enjoys a varied career as a chamber musician, soloist, opera coach and organist. Her recent chamber music engagements have included performances with the Chamber Music Society of Minnesota, Hill House Players, Bakken Trio, Music at Trinity, Colonial Chamber Music Series, Lakes Area Music Festival, and the Taos Chamber Music Group. Mary Jo performs frequently with the St. Paul Chamber Orchestra and Minnesota Orchestra and has performed with EOS Orchestra in New York City, and as a piano soloist with the New Mexico Symphony Orchestra and the St. Paul Civic Orchestra. She has worked for some of the most prestigious opera companies in the United States including the Metropolitan Opera, Santa Fe Opera, and Minnesota Opera and has performed recitals with singers from the Metropolitan Opera as well as with instrumentalists from many of the country’s major symphony orchestras. Mary Jo is a graduate of the Metropolitan Opera Lindemann Young Artist Program, University of Minnesota, New England Conservatory and St. Olaf College. Mary Jo has been the principal organist at Zion Lutheran Church since moving to Shoreview, Minnesota in 2005. Sarah Grimes joined the second violin section of the Minnesota Orchestra in 2016 and won a position in the first violin section in May 2017. Raised in the Twin Cities, she began studying the violin at the age of four. She is a graduate of the Northwestern University Bienen School of Music and formerly a member of the Civic Orchestra of Chicago. During the 2015-16 season, she performed full time as a Guest Musician with the Saint Paul Chamber Orchestra. While at Northwestern, Grimes was concertmaster of the Northwestern Symphony Orchestra, performer and cofounder in student-led ensembles, and a freelance musician in the greater Chicagoland area. She appeared as a soloist with the Minnesota Orchestra in 2005 and 2010 and with the Minnesota Sinfonia in 2012. As a chamber musician, she performed recently for the Liquid Music Series, the SPCO Chamber Music Series, and at festivals including Kneisel Hall Chamber Music and Astona International. Since joining the Minnesota Orchestra in 1990, Principal Flute Adam Kuenzel has regularly appeared as soloist at Orchestra Hall. In 2007 he gave the world premiere of Stanislaw Skrowaczewski’s Fantasies for Flute and Orchestra, Il Piffero della Notte, with the composer conducting. In 2009 he performed Bernstein’s Halil, earning acclaim from The New York Times and MusicalAmerica.com. He premiered Manuel Sosa’s Eloquentia: Espacio para Flauta y Orquesta in 2010; the work, which was written for Kuenzel, garnered the composer a John Simon Guggenheim Fellowship in 2011. In 2017 he was selected to premiere Laura Schwendinger's Aurora for flute and piano; commissioned by the National Flute Association for its annual convention, which was held in Minneapolis. Kuenzel has been a guest artist with the Aspen Music Festival, Grand Teton Music Festival, Spoleto Festival, St. Bart’s Music Festival in the French West Indies and Oregon Bach Festival. He has also appeared as guest principal flute with the Boston, Chicago and Dallas symphony orchestras, and the Seattle Opera. Trumpeter Charles Lazarus, a member of the Minnesota Orchestra since 2000, has charted a unique course during his tenure with the Orchestra. As a soloist, composer and bandleader, Lazarus has created and starred in three original orchestral shows featuring his jazz ensemble: “A Night in the Tropics,” “American Riffs,” and “Fly Me to the Moon.” "Merry & Bright,” his concert of fresh takes on holiday favorites, is the newest addition to the Orchestra's annual holiday fare. In April 2018, he is featured in a new program entitled “Our Love is Here to Stay” in collaboration with The Steeles and the Minnesota Orchestra. In 2015, Lazarus premiered Steve Heitzeg's concerto American Nomad, commissioned by Paul Grangaard. His composition A Perfect Square, paired with Michael Hall's book of the same name, was recently made into a children's animated short film. Lazarus made his Carnegie Hall solo debut with the New York String Orchestra at the age of 19 while still a student at The Juilliard School in New York. Since then, he has soloed with dozens of orchestras and ensembles throughout North America and has performed and taught master classes in every U.S. state, Canada, South America and throughout Europe and Asia. He's been a member of several of the best-known brass ensembles in the world including Canadian Brass, Dallas Brass and Meridian Arts Ensemble, and has performed with Empire Brass, London Brass and the New York Philharmonic Principal Brass. He has also performed his original compositions at the Montreal and Ottawa international jazz festivals, opened for Tony Bennett, and performed with Barry White and Joe Williams. Lazarus's four solo recordings, Solo Settings, Zabava, Merry & Bright, and Lovejoy showcase his wide-ranging talent and feature collaborations with diverse composers, arrangers and performers, including members of the Minnesota Orchestra. He is on the faculty of the School of Music at the University of Minnesota. For more information, visit charleslazarus.com. Katja Linfield, who joined the Minnesota Orchestra in 1990, is an active chamber musician and proponent of contemporary and lesser-known works. In recent seasons she has performed Tan Dun’s Elegy: Snow in June for solo cello and four percussionists, John Mackey’s bluegrass string trio Wrong-Mountain Stomp and Judd Greenstein’s string quartet Four on the Floor. She has also performed works of Dvořák, Hindemith, Brahms and Mozart; at Sommerfest 2014 she played Mendelssohn’s First String Quartet. Linfield was a member of the Bakken Trio from 1992 until 2002, a period during which the ensemble recorded works of Ives, Pärt and Beethoven. She has twice received the McKnight Fellowship for Performing Musicians, in 2006 as soloist and in 2001 with the Bakken Trio. Linfield has performed chamber music at the Marlboro Music Festival, Chamber Music Society of Lincoln Center, Tanglewood Festival, Portland Chamber Music Festival, Music in the Vineyards, Cactus Pear Music Festival, Alexandria Festival of the Lakes, Phipps Center for the Arts, Music on the Hill in Mankato, and the Bach Dancing and Dynamite Festival in Madison, Wisconsin. She has toured the United States with Music from Marlboro and Europe with the Frankfurt-based Ensemble Modern. Linfield earned a bachelor of music degree from Oberlin College and a master’s degree from the New England Conservatory and Rutgers University. Her teachers included Bernard Greenhouse, Colin Carr, Steven Doane and Richard Kapuscinski. Rapier joined the Minnesota Orchestra in 1986 and was appointed to her current position in 1991. She has been a featured soloist with the Orchestra in works by Haydn, David Ott and Kevin Puts, the latter being the world premiere of his Sinfonia concertante in 2006. Throughout her tenure with the Orchestra she has performed regularly at its Sommerfest, McPhail and Target Atrium Chamber Music concerts. As a guest soloist, Rapier has appeared with the Colorado Philharmonic, Louisville Orchestra and numerous regional ensembles. During the 2013-14 season she joined the cello section of the Dallas Symphony for concerts on its European tour as well as in Dallas. An accomplished chamber musician, Rapier has won awards at several competitions in the U.S. and Canada and has performed quartets throughout Europe, Asia and the U.S. She is a regular guest at chamber music festivals, including Cactus Pear, Music in the Vineyards, Bach Dancing and Dynamite Society, and Orcas Island. She was a founding member of the Rosalyra Quartet, which won a 2000 McKnight Foundation Artist Fellowship and performed for nearly 20 years at venues from the Twin Cities to Boston, New York City and France. With the Rosalyra she has recorded works by Bartók, Beethoven, Brahms, Fauré and Shostakovich for the Boston Records and Artegra labels. Born into a family of distinguished musicians, Rapier began her professional career at age 16 as an apprentice with the Louisville Orchestra. After studying at Indiana University and in New York with Janos Starker, Fritz Magg and Timothy Eddy, she performed and taught for two seasons with the Apple Hill Chamber Players of New Hampshire. In 2005 Rapier was again named winner of a McKnight Foundation Artist Fellowship for her performance of cello duos with Anthony Ross, principal cello of the Minnesota Orchestra, who is her husband. Together, the duo has organized numerous benefit concerts for Habitats for Humanity and the American Refugee Committee. They are the proud parents of Eli, a trumpeter, and Erin, a dancer and singer. 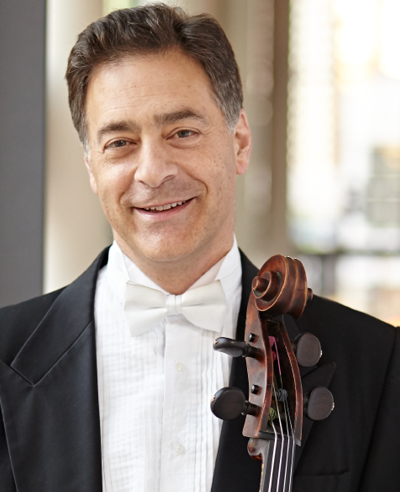 Principal Cello Anthony Ross joined the Minnesota Orchestra in 1988 and assumed the principal cello post in 1991. He has been a soloist many times with the Orchestra, performing concertos by Schumann, Dvořák, Victor Herbert, James MacMillan, Beethoven, Saint-Saëns, Elgar and Shostakovich, as well as many chamber works. He was most recently featured as soloist in in June 2017 performing Bloch's Schelomo. No. 80 with Atlanta Symphony, sings Carmina Burana with Virginia Tech Symphony and performs as Count Almaviva in Il barbiere di Siviglia with the Glimmerglass Festival. Recent concert highlights include the tenor solo in Händel’s Messiah with the South Dakota Symphony Orchestra and Rogue Valley Symphony, Mendelssohn’s Lobgesang with Lipscomb University, Cantata BWV 43 with Atlantic Music Festival, Rossini’s Stabat Mater at the Glimmerglass Festival, and Cantata BWV 88 with the Minnesota Bach Ensemble. Mr. Walton also performed theatrical roles including a Soldier in All is Calm with Theatre Latte Da & Cantus, Ned Poins in Henry IV Pt. 1, Lun Tha in The King and I, and Fenton in The Merry Wives of Windsor all with Oxford Shakespeare Festival. David was the Upper Midwest regional finalist at the Metropolitan Opera National Council auditions. He was also awarded the Twin Cities’ “Next Step” grant by the Metropolitan Regional Arts Council. Mr. Walton holds a Bachelor of Music Education degree from Harding University and a Master a Music in Vocal Performance degree from the University of Mississippi where he performed Marco in The Gondoliers and Rinuccio in Gianni Schicchi. Howard Watkins is a frequent associate of some of the world’s leading musicians both on the concert stage and as an assistant conductor at the Metropolitan Opera. He has performed in numerous recitals and concerts throughout North and South America, Europe, Russia, Israel, and the Far East. In recent seasons, he has appeared in concert and on television with Kathleen Battle, Grace Bumbry, Mariusz Kwiecien, Michelle DeYoung, Natalie Dessay, Diana Damrau, Anna Netrebko, Rolando Villazón, Elizabeth Futral, Anthony Dean Griffey, and violinist Sarah Chang. Under the aegis of the Marilyn Horne Foundation, Mr. Watkins has performed in recitals and educational residencies in the US, and has also appeared in the Horne Foundation gala New York recital. Arts Program Co-Coordinator, and he has taught at the Aspen Music Festival and School, Meadowmount School of Music, North Carolina School of the Arts, International Vocal Arts Institute in Tel Aviv, and International Institute of Vocal Arts in Italy. A native of Dayton, Ohio, Mr. Watkins received his undergraduate degree from the University of Dayton, and he completed his Doctor of Musical Arts Degree at the University of Michigan. In 2004, he was honored as the recipient of both the Paul C. Boylan award from the University of Michigan and a Special Achievement Award from the National Alumni Association of the University of Dayton.